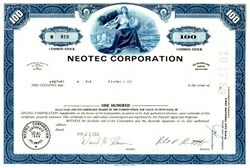 Beautifully engraved certificate from the Neotec Corporation issued in 1969-1970. This historic document was printed by the American Banknote Company and has an ornate border around it with a vignette of an allegorical woman holding a globe. This item has the printed signatures of the company’s president and secretary and is over 31 years old. NEOTEC's first commercial NIR analyzers were purchased by the Canadian Grain Commission to measure wheat quality at grain terminals in Thunder Bay, Vancouver, and Winnipeg. The instruments made use of technology developed by Karl Norris, a spectroscopist and research scientist at the USDA Agricultural Research Labs in Beltsville, Maryland. After NIR proved its value by rapidly measuring protein levels in wheat and barley, NIR analysis was quickly adopted for use in hunrdeds of grain elevators around the world. The Pacific Scientific Model 6250 high-performance scanning grating instrument for industrial applications A filter based analyzer for agricultural feed and forage analysis To enhance its capability in forage analysis, the company acquired exclusive rights to the ISI forage analysis software developed by Dr. John Shenk of Pennsylvania State University. This strategic move helped the company become the leading supplier of feed and forage analysis systems. Improved quantitative accuracy of the new scanning grating NIR technology Advances in the chemometrics software which analyzes NIR data The advent of the personal computer with high-speed math capabilities NIR analysis proved to be a time-saver and cost saver when used in place of slower conventional testing methods by industry. It gradually found widespread laboratory applications across a number of industries, including pharmaceuticals, polymers, chemicals, food processing, pulp paper, and more. Pacific Scientific continued product development, and in 1989 introduced a new line of grating instruments under the trademark “NIRSystems”. The modular design of the new instruments made possible interchangeable sampling accessories, as well as fiber optic interfaces which could adapt to laboratory and on line applications. This opened a new door for real time monitoring of chemical processes. In 1989 a Swedish instrument company, Perstorp Analytical bought the NIR operations of Pacific Scientific and gave it a new name NIRSystems, Inc. The new NIRSystems modular product line was introduced at the Pittsburgh Conference in March 1989, and the development of a range of pharmaceutical analyzers and on-line analyzer systems followed. All were based on the new modular spectrophotometer design. In 1992, NIRSystems became only the third U.S. analytical instrument manufacturer to receive ISO 9002 Certification. The company continues to operate under a quality system that complies with the internationally recognized quality standards of the International Organization of Standards. In 1997 the company was sold once again, this time to the Danish instrument maker Foss Electric. Foss is the world’s largest company in food and dairy analysis, and Foss NIRSystems instruments are marketed today for a wide variety of applications, including: food processing dairy processing agricultural trading and processing pharmaceutical processing chemical and polymer processing Foss NIRSystems, Inc. employs more than 100 people at its headquarters in Silver Spring, Maryland, U.S.A.
Information of company was obtained from company website at http://www.foss-nirsystems.com/Cohist.htm.